Jeff Poindexter first ran for NBR at the Red Hook Crit in May 2016. “I wanted to run for a local team that could possibly challenge and beat the best of NYC,” he says. 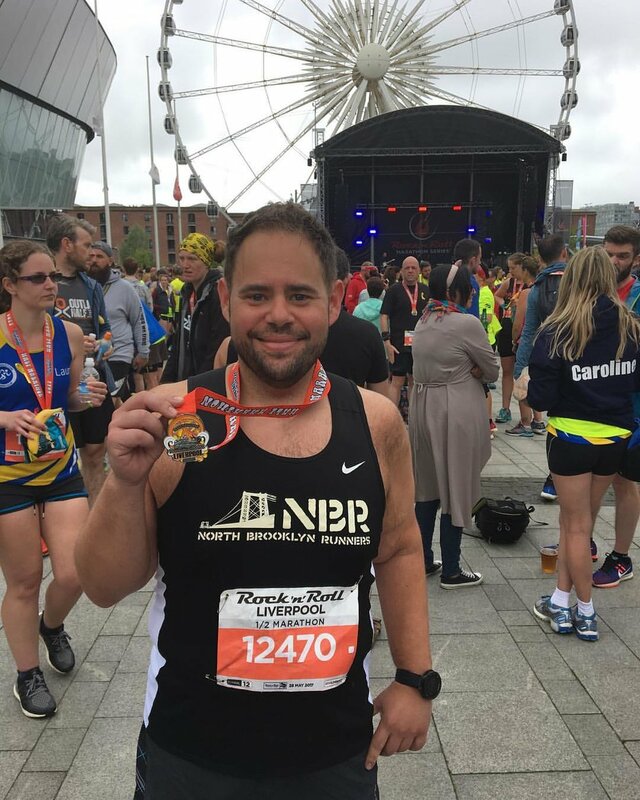 Since then, he’s been surprised to watch how being part of NBR has helped him grow as a runner. As someone who loves 200 meter races just as much of the marathon, Jeff’s become a standout on NBR’s local competitive team, and was chosen as April’s Runner of the Month. What he does when not running: I work as a doorman/lifeguard for a residential building on the Upper East Side call the Concorde. How he first got into running: I've played sports my whole life. I was always one of the fastest. In elementary school, every year the physical fitness test came up and we had to run a mile. I used to eat skittles for energy during the mile. Best running memory: In high school, nine men including my brother and I won the regional meet. We were the underdogs, facing teams three times bigger than us. Advice to running newbies: Don't be so quick to compare yourself to others. Be the best you. Take your time building mileage and take hard days hard, easy days easy. Do dynamic stretching before your run and static stretching after. Finally, water, water and agua!!! Current running goal: I'm racing the Queens marathon and NYC marathon this year, thanks to NBR for the motivation. Fun fact: When I'm not playing frogger in the streets of New York, I like to participate in some fitness modeling. You know, trying to inspire people. When I was 5 or 6 years old, I enjoyed flying kites. The Myrtle Beach marathon reminded me of those old days flying kites. Marathon training is like winding the line for the kite, making sure that the line is the right weight, not broken, not entangled and long enough to fly your kite as high as you can. The race itself is like patiently unwinding your line, according to wind speed. Sometimes the wind dies down, sometimes it gets gusty. Each mile, you carefully unwind the energy and everything you prepared, covering the distance with the right pace, making sure that you don’t waste unnecessary energy, telling yourself not to get carried away or too excited. Also, if you are in competitive battle, you don’t want to show how much extra line you have left to your friend until the right moment. When I watched the Tokyo Marathon live stream on Saturday night, Suguru Osako, arguably best Japanese marathoner today, training with Nike Oregon Project, started his race positioned at the back of lead group, as usual. It looked all “in control” until half way. He looked calm and composed. He looked so lean—different from Yuki Kawauchi, who is built stronger. Suguru looked even more shaved than when he finished third in the 2017 Boston Marathon (his debut race) and when he broke Japanese record with 2:05 in Chicago 2018. Around mile 18, he started slowing down and soon started walking with his shoulders shaking. It clearly looked he had hypothermia, probably due to very low body fat percentage, like Galen Rupp, Shalane Flanagan and many other elite athletes who suffered last year in famous rainy and windy Boston Marathon. Going back to my race…. Until last year, I used to do only two marathons per year. Typically one marathon in the spring and another in fall. But this year, I wanted stir things up a little bit and challenged myself to start the year with two spring marathons. Myrtle Beach was my first on March 2, and I plan to run New Jersey on April 28. Preparing for this double marathon, I have been running about 70 miles per week since the beginning of December. As I approached the date of Myrtle Beach, I almost felt like I didn’t want to give up my 70 miles a week streak . At the same time, I was bit lazy with my speed training—in the cold weather, I never felt comfortable doing intervals. I was drifting from the leader pack on Saturday’s local competitive long tempo runs. Maybe I was doing bit too much volume, and not enough quality, but I told myself this was part of experience, and I would try and see. Doing two marathons eight weeks apart is a new experience for me, and I am only halfway through. I decided to use the Myrtle Beach Marathon as a continuation of my long run training. So I aimed to do a 26 mile “long run" at the race, starting with sub 7 minute/miles and seeing how long I could hold the pace without proper pre-race “tapering” or a lot of speed training. From miles 15 to 20, I was still within 10-15 seconds of my target (except for mile 17, when we had a slight incline and head wind at the same time). From mile 21, I started thinking, Do I unwind the line same way I was doing? Or do I save? In a way, these were sort of negative thoughts. I wanted to have more or less “seamless” training to the New Jersey Marathon. I started easing a little bit and took it to the end. Finishing miles are always tough in the marathon, but I wasn’t suffering like I was in the NYC marathon when I was climbing the 5th avenue “wall” and entering Central Park. When I crossed the finish line, I received my medal and heat sheet, but I didn’t really need it. I continued jogging to the area where they were giving pizza, donuts and bananas. I grabbed a few bites and continued walking to my hotel (Courtyard by Marriott), which was two minutes from the start/finish area. I knew I only had a hour to check out at 11 am. I could have nicely asked for a late check out. But I didn’t really want to bother. I did 20 minutes of my routine stretching and yoga, took a 20-minute hot shower and I didn’t really feel any of the pain and calf cramps I usually feel after 26.2. I didn’t really unwind the line I had. My kite didn’t fly as high as it should have. But it was okay. My time was 3:08:16, about 30 seconds slower than my PR in NYC. I usually run the next day to flush out the lactic acid but I usually can’t run faster than 9:00/mile since my legs are tight. But, this time, I felt fine doing 8:00/mile. I ran from my home in Dumbo to the West side, up to 14th Street and caught the subway. Now, my real challenge starts. I have eight weeks to first rest my body, then start training hard with long tempo runs, intervals, supplemental core and strength training to get myself ready to fly my kite the highest I can in New Jersey on April 28th. good number of fluid stations. Kaitlyn DiBello started running 17 years ago, first as a mid-distance runner/long jumper, then a steeplechaser in high school and a 5k/10k and cross country runner in college. Before moving to Brooklyn she was a head cross country and track coach. Favorite race distance: Marathons and half marathons! I love the feel of pushing myself and doing something I love for miles upon miles. But I’ll always have a special place in my heart for a good 5k or 10k, especially on the track. Favorite race: The NYC Marathon and the NYC Half. The fact that the whole city is out there cheering you on is such a surreal feeling. It is always an honor to represent both NBR and Brooklyn in those races on the streets we train on every day. Favorite NBR run: Either Tuesday Night Tempo or Thursday night track. I love pushing myself with the team and the promise of pizza afterwards is always great. But in summer Narwhals and local competitive definitely become favorites, especially when we get to hit summer streets. Best running memory: Finishing the 2018 NYC marathon. It was my second marathon and I set out to qualify for Boston. I had trained on and knew the course. As I passed my co-workers and teammates on Bedford Ave, I knew I was in a good position. With my parents cheering me on when I hit 1st Ave I knew I had to keep pushing. Having teammates throughout the whole city, especially on 5th Ave, helped me overcome the tougher pieces. I really knew I had a chance when I passed mile 24 and saw my mom jumping up and down and my dad yelling at me to keep going. As I rounded to the finish I could feel the excitement build, and had tears in my eyes when I crossed the finish line in 3:06. I immediately thought of my grandfather. He was one of my biggest supporters and had cheered me on at every single race. Once that medal was placed around my neck I dedicated it and my race to him knowing how happy he would have been for me. The best part of the race was checking my phone and seeing how many teammates, friends and family members had texted me either during the race or after with congratulations. Knowing that they had been with me the whole time made the accomplishment that much sweeter. What running’s taught her: That anything is possible. If you told my 10-year-old self that I’d be a marathoner, I would have thought you were crazy. But now I know that no dream is to big. Knowing that every ounce of work I put in allows me to get better pushes me to work hard. It has also reminded me to stay humble, to keep dreaming and setting new goals. Favorite post-race food: Anything with chocolate, and a good cup of Irish breakfast tea! I have a big sweet tooth. I also love having a superhero muffin from Shalane Flanagan’s cookbook on hand. Favorite piece of running gear: My garmin. It feels weird to not have it there. I’m also a huge Asics fan and can’t go wrong with either my GT-2000s or DS trainers which have seen their fair share of blood, sweat and tears. Those who really know me know that I’m never seen without a pair of shorts and a tank top on—regardless of the weather. Favorite songs to run to: I have a whole playlist that I will gladly share with anyone who wants it! I always have to start with either “The Champion” or “Good Girl,” both by Carrie Underwood, “Miami 2017” by Billy Joel, “Heartland” by Celtic Thunder or “Land of Hope and Dreams,” “Hard to Be a Saint in the City” by Bruce Springsteen or “I Want It All” by Queen. Favorite pro runners: Shalane Flanagan, Deena Kastor and Paula Radcliffe. Having watched these ladies over the years I have learned how to not only be a better runner but also how to train smarter and how to pick myself up after I fall. Seeing how they have collected themselves after a downfall and remained true to who they are and celebrated their successes just proves to me that if you dream it and work hard, you can achieve it. Favorite running social media account: Brooklyn Running Company. Though I may be biased since I work there part-time. Best advice to running newbies: Don’t quit! Running is all about being patient and sticking with it. Continue to work hard, and find a running partner. Also sign up for a race or set a goal. I have found that when I have a targeted goal in mind, I train smarter. One thing I was always told is that if you’re not enjoying it, then you need to fix something. Make sure you find the fun of it. Want to nominate an NBR member as Runner of the Month? Send the board nominees along with a brief description. The dimensions looked for are: performance, improvement, participation, volunteering and support. A runner does not need to fulfill all of those categories, but it’s a good starting point. We will feature runners from any pace, showcasing the breadth of our team—from our inspiring top scorers with incredible performances to brand new runners hitting significant running milestones. Hello all! For our tenth anniversary, we wanted to celebrate the individuals who run for this team. We have started a video series, which will feature all kinds of our awesome runners so we can learn more about who we are and what the team represents. We are aiming to have four videos, one released each quarter. We want to recognize all of the incredible runners on NBR. What better way than going straight to the people who make this team great? Imagine, like you should fairly regularly, that it's the end of the world and you need above-average survival skills to make it in the every man/woman for him/herself post-apocalypse wilds. You’ll want to not only run fast, but quietly. Loud footsteps are often an indicator of braking: Your joints are not flexing enough to carry the impact of each stride into the next one, but instead are redirecting your forward momentum into shockwaves that move up through your body. And you don't want to brake! Can you hear Kaitlyn’s footsteps? Didn’t think so. If you or your running partners can hear your footsteps clearly, you'd probably starve in our scenario—or more likely, you'd be food for something else. Particularly on hard surfaces, quieter running means you’re making less contact with the ground—and that is one idea that most experts seem to agree on that increases speed and efficiency, and reduces injury. Think foot "lift" instead of foot "strike"
Remember you are sneaking up on your victim! Want more great form advice? Check out NBR’s form run in Prospect Park every Wednesday night! In the winter of 2001, when I was 14, my mom showed me a story in the sports section of The New York Times. 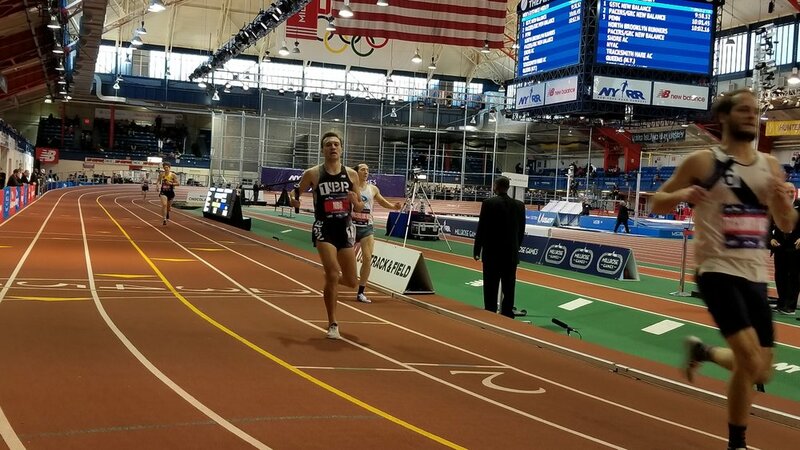 A senior from Northern Virginia had just become the first American high schooler to ever break 4:00 for the indoor mile. He did it at a track on 168th Street in Harlem—the Fort Washington Armory. His name was Alan Webb. That race was a flashpoint for me; I’d started running cross country in the fall, but from that moment on I decided I was another breed of runner: a miler. I went out for indoor track the next year and just squeaked under 5:00 for 1600 meters. I was a world apart from Alan Webb, who was by then a freshman at the University of Michigan, but what I’d run felt respectable, too, in its own way. Though I ran other events, at the end of a meet usually struggling through the two mile for a few points, I stayed focused on the mile. Racing it indoors, in particular, thrilled me; flying around those tight turns always heightened the drama. Then, sometime during my sophomore year, I became aware of the ultimate indoor meet, the Millrose Games, where the best high school, college, and pro runners gathered for a glamorous day of what looked like the Oscars of track and field. Even the name Millrose had such poetry: It was the Pennsylvania country estate of the meet’s founder, department store magnate Rodman Wanamaker (who was also, I learned, the first person to play the Star-Spangled Banner at a sporting event). It became my goal to one day run there. From its founding through my high school and college days, Millrose wasn’t at the Armory; it was held at Madison Square Garden, on a quirky, 180-yard, 11-lap-to-the-mile track known for its spongy surface—in his novel Once A Runner, John L. Parker Jr. said it was like green pound cake. But there was undeniable pageantry to racing at the Garden, in a meet broadcast live on NBC with commentary by luminaries like Frank Shorter (who, like all the other officials, wore a tuxedo). The meet had been held every year since 1908; in the early days, when you could still smoke at Millrose, officials simply asked spectators to extinguish their cigarettes before the last event, the Wanamaker Mile. And so, far above the runners getting in their last strides, clouds of smoke could be seen wafting to the rafters. I was a couple years out of college the first time I actually went to watch Millrose, in 2011, the last year it was held at the Garden. Some college teammates met me there, including Andy Kifer, who later introduced me to NBR. We were glad to catch the final Millrose at the legendary venue. But it seemed to be a down year. The two mile was embarrassingly thin, the guys at the back of the pack hardly faster than we had been. Those were the wilderness years for American distance running, but had things really gotten that bad? Then came the Wanamaker Mile. I still remember the fog spreading out from the tunnel, the strobe lights raking across the track, the procession of milers trotting out, waving to the crowd—Lee Emmanuel, David Torrence, Deresse Mekonnen, Bernard Lagat. The race wasn’t that fast by Millrose standards—it was won in 3:58—but it was almost operatic, the tension mounting with every lap. When Mekonnen outkicked Lagat, I could have cried. We kept going to Millrose every year, Andy Kifer and I. Lagat never won again, but we were there a few years later when he set a world best in the 2000m—an obscure distance, sure, but it was still incredible to see him run a 3:57 mile en route, at age 41. And we were there that same afternoon when Alan Webb ran his last pro race, a 4:06 in the B heat of the mile, barely faster than he ran as a high school sophomore. It was an anticlimactic end to a career that never quite fulfilled its early promise, but it was nice to see him sign off on the same track where he’d first broken 4:00. Even the announcer, Ian Brooks, was the same. Almost five years later, in December, I learned we could enter the Men’s Club Distance Medley Relay at Millrose. NBR is mostly a distance team, with people training for 5Ks and halfs and marathons (as you do in your late 20s and 30s and beyond), while the DMR consists of four short- and mid-distance legs: 1200, 400, 800, and 1600 meters. But we do have some speed on the roster. Jeff Poindexter ran a 49 second 400 in high school. A long time ago, sure, but still: 49. Ned Booth was running some crazy track workouts this fall. Conor Lanz had run a 3:42 for 1500m in college, the equivalent of a 4:00 mile. That was during the Bush Administration, I know, but he looked fit ... And we were living in the Ciaranaissance, a year of magical thinking when anything felt possible. Now, there was reason for caution, too: Some research told me the field would be fast to quite fast: The New York Athletic Club and the Central Park Track Club both had Olympians in the mix, and a few teams could field sub-4:00 milers on their anchor legs. But we were getting faster, too, and I’m prone to impulsive decisions. So I wrangled some ringers for the 400 and 800 legs and entered us with a seed time that didn’t feel totally outrageous. I’ll admit, riding the A train up to 168th Street on Saturday morning, I wondered whether I’d made a mistake. The start lists had been released, and NYAC had Brycen Spratling on the 400, a two-time Olympian and the American record holder in the 500m. Somehow the University of Pennsylvania was in the race—I hadn’t anticipated going up against college kids. And Tracksmith’s team—were these guys pros? I didn’t want to get lapped. By the time I entered the Armory through the green athletes’ doors on 170th Street (a first for me), I was praying we could just keep things respectable. By the time I got the baton for the 1600m leg, we were suddenly in the race. Ned called splits—31.7 for the first 200 (too much adrenaline), 63 for the first 400 (still too ambitious). But by 800 I’d settled into a rhythm, going through in 2:09, and I caught a couple guys. Tracksmith’s anchor leg passed me on the last lap, but I managed to stay within a second of him, crossing the line in 5th out of 8 teams. We’d run 10:25, not too far off my seed time. And James Chu told me I’d split 4:19.8—faster than I ran in high school, close to what I ran in college. His training has rejuvenated me to an amazing degree, but still, I was shocked. I stumbled upstairs to meet my friends Trish and Sam and Andy Kifer in the balcony, and for the next few hours, in a stated of blissed-out delirium, I watched heat after heat of races I otherwise would’ve ignored: the Suburban Boys High School 4x800, the Fastest Kid in the World 55 meters, the Mixed Master’s 4x400. Later in the afternoon, the real fireworks started, and it was the best Millrose I’ve ever seen. Donavan Brazier took down Johnny Gray’s 26-year-old American record in the 800, and Ajee Wilson followed suit in the women’s 800. Konstanze Klosterhalfen, a 21 year old from Bonn, Germany, soloed a staggering 4:19 in the women’s Wanamaker Mile. And in the men’s, Yomif Kejelcha ran a 3:48.46, missing Hicham El Guerrouj’s world record by a hundredth of a second. But the race that captivated me most was, as always, the boys’ high school mile. A senior from Virginia took it out hard, going through 800m in 2:05. He’d been third last year, the announcer said; he seemed determined to win it now. And it looked like he would—he had a 20-meter lead at the bell. But in a blanket finish, three boys caught him at the line, all four of them running 4:09. Last place was 4:17, fast enough to win some years. As a 32 year old, you don’t want to be comparing yourself to high schoolers. It’s not a good look. But I’d be lying if I said I wasn’t doing the back-of-the-envelope math from my balcony seat, thinking about whether I could get into the high school mile next year. Probably not. Not quite. But it’s nice to have another race on the horizon, even if it’s only the Men’s Club Distance Medley Relay. And for four-odd minutes it was also nice to be transported back to the winter of 2003, lining up on the blue-gray indoor track of Fork Union Military Academy, going head to head with the great Kippy Keino, son of the gold medalist, just back from the Millrose Games. He was going to beat you, that was certain. But you were still growing, you were getting faster all the time. You might be able to close the gap in the season ahead. And that’s one great thing about running: You still can. On Thursday last week, I had the chance, along with a number of NBR folks, to go to the NYRR club night. For those who don’t know, this is an awards show that New York Road Runners puts together to celebrate the achievements of local clubs. It segues into a moderately awkward dance party (I’m English, all dancing is awkward!). We had a number of runners nominated, and already knew we had won a few team awards. Most awards are given out to the best runners in their age group (in batches of 5 years—20-24, 25-30, etc). After eating a serving of tater tots that would make Napoleon Dynamite proud, the event got under way. We had a loud NBR table and the cheers for our runners were palpable in each award we had someone nominated in. We got even louder when Angela went on to win her award. She has had an incredible year, qualifying for the olympic trials, PR’ing, and outright winning races! As we sat there, it really struck me how amazing these achievements are. As a free-for-everyone running club, we were strongly in the rankings in a great deal of categories. This takes the hard work and dedication of so many people throughout the year and helps put those team stats emails into context. The 50+ men was particularly fun to see announced since a lot of them were with with us on Thursday, including our newest recruit, Masamichi. Overall, as a celebration of NYC running, and of our team, it was a great event. The part that really impressed me however was just how incredible the folks with the higher age awards were. It felt like the numbers just kept cycling up, including men and women in their 70s and 80s who had run more than 20 NYRR races in the last year. As someone who got into running a bit later in my life, it was truly inspiring to see all that they continue to achieve, and really made me realize the role that running can play in my life for the long term. I left feeling very inspired and a little less annoyed at having to run in the terrible cold weather the next day. Oh, and as an English awkward dancer, I briefly danced awkwardly. It wasn’t pretty. Bring on the NBR Gala! Seth Pompan showed up to his first NBR run in November 2016, the day after that year’s New York City Marathon. Having completed a couple of marathons in 2012 and 2013, he’d caught an itch to attempt another. But he’d only do it if he could train with a group.